This document summarizes the results of a study which developed pilot media messages to support and/or encourage anti-DWI norms. The target audience for these messages was individuals 18-25 years of age. Initially, focus groups were held in the Boston and San Diego areas with 65 members of the target audience to discuss current social norms, to identify attitudes and behaviors concerning drinking and/or driving after drinking among the target group, and to clarify messages or concepts which would have the highest chances of impacting this group. Next, messages were developed around "consequences" and "intervention" themes, the two themes which the focus group participants and the authors' research indicated were likely to have the best chance of changing behavioral norms. 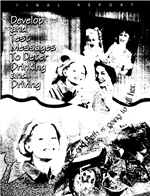 Three pilot messages were developed for each theme. A total of 495 members of the target audience in Overland Park, Kansas and Wilmington, North Carolina reviewed these six messages in focus groups and testing paths. The quantitative analyses on data obtained from the testing methods strongly indicated the major variables affecting message effectiveness were the message itself, site and gender. Despite these differences, the same message preference pattern held for both underage (18-20 years) and legal age (21-25 years) drinkers, both genders and both sites, implying that a viable target audience could include all persons ages 18-25. The messages, in storyboard format, are included in this report. Amy Berning was the COTR for this project. Some of the photographs in this report are copywritten and should not be copied.